With their debut EP recorded and slots at the BBC Proms Lates and London Jazz Festival now confirmed, the future is looking very promising for the Greek-Anglo jazz band Valia Calda. 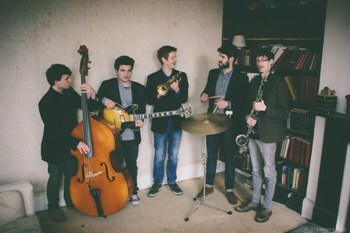 The five-piece met while students on the BA Jazz degree and have spent the last year rehearsing and recording their debut EP, a free-flowing fusion of Greek folk and contemporary jazz. Valia Calda began life in 2013 as a trio, with Greek brothers Thodoris and Nikos Ziarkas joining their friend and fellow BA Jazz graduate Rob Milne to create the band. "We had wanted to do something since we came to England - a group that will introduce bits of music from our own country with traditional jazz," said 24-year-old graduate Thodoris, the elder of the two brothers. With Thodoris on double bass, 22-year-old Nikos on guitar and Rob, 24, on bass clarinet, the band had its foundations but they quickly took on two new members. "We started with just us two and Rob, and then we thought let's put some more guys in you know, so we tried trumpet and drums and it all fitted together perfectly," Thodoris explained. Trumpet came in the form of 26-year-old Londoner Sam Warner, the only non-Middlesex University member of the band, while 2011 graduate Gaspar Sena, originally from Portugal, brought the percussion. Inspired by the jazz they studied at Middlesex yet heavily influenced by the traditional folk music that Thodoris and Nikos grew up listening to on the Greek island of Rhodes, Valia Calda's music has its own unique character. It's therefore not surprising that just a year after forming they are beginning to gain recognition and high profile gigs are starting to come their way. BA Jazz co-course leader Rob Townsend, who encouraged them to apply to perform at the BBC Proms Lates, said: "It's a great opportunity for them because they will be broadcast on BBC Radio 3, and to be associated with both the BBC and the Proms is a fantastic experience. "We're very pleased for them. We have fantastic students on the BA Jazz course and a lot of them are out there working professionally, so we're very proud of what they have achieved." The band, who recorded their five-track EP in the studios at Middlesex, are quick to credit the university for not only bringing them together but also for the influence it has had over their music. "We're really happy to have Middlesex because the equipment here is really good and we have been able to do our recording here," revealed Nikos. "Without Middlesex we wouldn't have formed the band, but we also wouldn't have had the knowledge to put such music together. We started with our Greek folk music, but without the teaching of our tutors our music wouldn't be the same because they gave it a new touch. We were very influenced by their work, albums and the way they play." If all goes to plan, it won't be long before Valia Calda release their own album, with the band already planning to begin work on their first LP. "We recorded the EP almost a year ago and in that time we've changed so much," said Thodoris. "After we release it that chapter will close and then we'll move forward and hopefully record our album over the next six or seven months." Valia Calda play the BBC Proms Lates at the Royal Albert Hall on Saturday 6 September 2014. 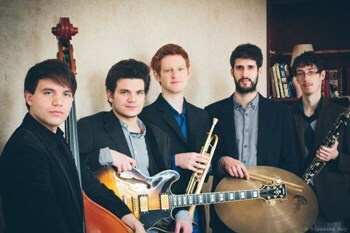 To find out more and listen to their music, visit: www.valiacaldaproject.com.